Jay, I just wanted to send you a quick note to say thanks for a great party. I am sorry we missed Wes to thank him for being so great with the kids. I also wanted to tell you that I wrote up a review on Yelp. You should be able to view it here. Tired of the same old party ideas? Kids too old for a cheesy mouse party? Worry about spending money for kids to play violent video games? We have a great idea for a kids birthday party. 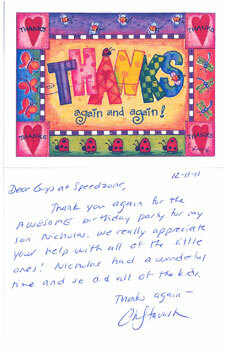 Throw a "Slot Car Racing party" at the SpeedZone Raceway in NJ! We offer a safe, clean, bright environment where kids can have fun and experience the thrill of racing without any risk. No prior experience needed. Every party has a "Race Director" who will instruct the guests on how to use the slot cars and the "Rules of the Road" to ensure all guests have a memorable experience. Great birthday party idea for boys and girls. Check out our Party Packages below. I'm sure we have a package that will suit your needs. Got questions? No problem call us at 609-702-0146 and ask for Jay. Includes: 1 hour of racing on any one of our tracks, and 1/2 hour in the party room to enjoy SpeedZone provided food ( 2 slices of pizza per guest,) drinks (bottled beverages three choices) and snacks (pretzels , chips.) We provide racing theme table covers, plates, napkins, and cups. Birthday person will receive a 1/32 Womp Womp slot car and each party guest will receive a special race bag. Race bag includes misc. race theme party gifts, examples being but not limited to : race car tattoos, plastic car, candy treats, balloons and 1 Free return pass for used on you next visit. Customer to provide cake and cake serving utensils. Includes: 1 hour of racing on any one of our tracks, and 1/2 hour in the party room to enjoy SpeedZone provided food (2 slices of pizza per guest,) drinks (bottled beverages three choices) and snacks (pretzels , chips.) We provide racing theme table covers, plates, napkins, and cups & serving utensils. Customer to provide cake and cake serving utensils. Includes: 1 hour of racing on any one of our tracks, and 1/2 hour in the party room. Package includes clean up of customer brought items. We provide racing theme table cover. Customer can provide food, snacks soda (must be clear), cups plates napkins and decorations. Add a 'thank you" party guest gift bag to any package above for $6.50 a bag. Race bags include misc. race them party gifts, examples being but not limited to; race car tattoos, plastic car, candy treats. balloons and 1 Free return pass for your next visit. Additional guest opts; $15 for 1st and runner up, $10 for Show. Want an even bigger party? Call 609-702-0146 ask about adding a second track.